Discussion in 'Trek Tech' started by Praetor, Aug 18, 2013. I've shuffled the drawings a bit to make the two secondary hulls line up at the shuttlebay deck and the forward bulkhead that the defelctor machinery attaches to. This may not be what you meant, but hopefully it'll get you in the direction you're looking to go in. I'm almost 100% sure that's Simon Matthew Coles' model of the Excelsior from Sci-Fi Meshes. Ask Tobias, but I'm sure that pic isn't his model. FWIW, I think the larger Excelsior makes more sense. The original intention may have been to make it smaller but that's not what we see on screen, and it strains credibility to try and squash everything in. Yeah, I like the bigger size. Let's not forget that linefrom TUC..."By God, that's a big ship!" While I like the larger version, and I don't see why it couldn't be that large, it just feels too big for the era... Not exactly a logical statement, but that's my stance on it. I like the larger Excelsior size as well. It meshes alot better with whats on screen. The era that built that spacedock? The fine line between continuity and fanwank. I'd go with the larger Excelsior. To me, 622 meters is overall more convincing. And one for the smaller. Kinda. Any others favoring the smaller one? Now you're just making up numbers to mess up my math, ain't ya? My bad, it might be but I had seen renders of it with "The Light Works" on them, which I thought was Tobias Richter. That really nicely helps reinforce again how indeed it is possible the two designs are the same ship, just rebuilt and reorganized a bit. So not that it's very definitive, but this is kind of neat. Have a look at the Lakota and the Defiant scaled against one another. So, with the larger Excelsior we end up with the larger size postulated by Bernd over at EAS, and at the smaller/official Excelsior we end up with a ship slightly larger than the official Defiant size. As a final thought for the day, this is what the 305 meter Enterprise refit looks like next to the Excelsior. Not that I necessarily think the refit has to be 305 meters, mind you. Just for giggles. 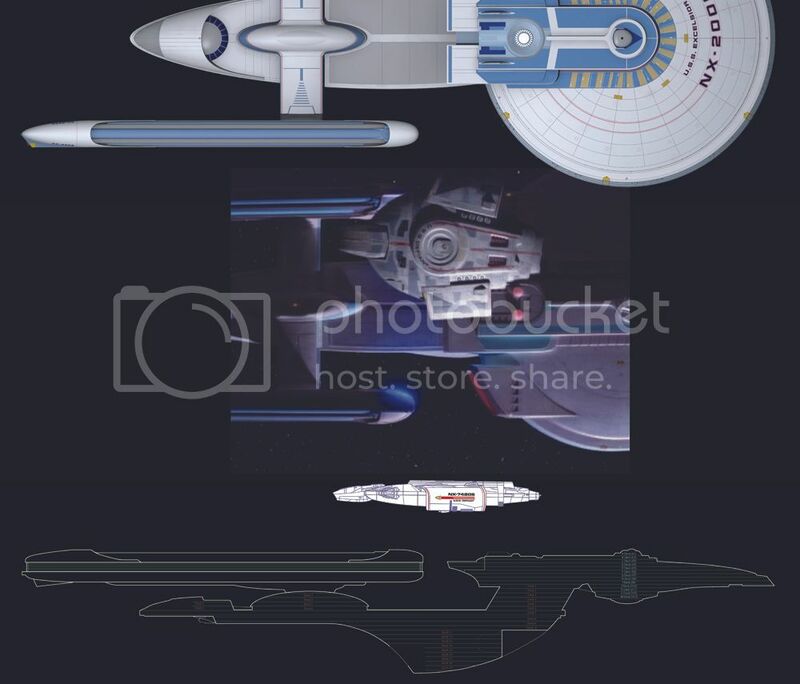 i want you to just try this for the TOS star ship onlt, from the inside and out side of the ship, i do like where you are going with this but i do need it for this ship only of ncc1701 enterprise, no A,B,C,or D,E. just this one only. @Praetor: Count me in for the large Excelsior too. 467 meters still for me. 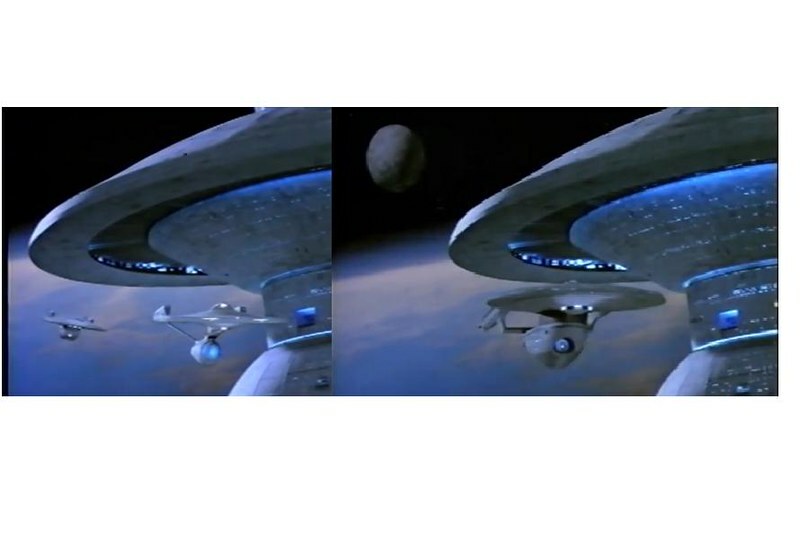 It doesnt look twice the size in ST3 when the Enterprise escapes space dock. Is there a chance I can still see a size comparison where the size of the hull markings are matched (i.e. saucer letters, engineering hull pennant)? 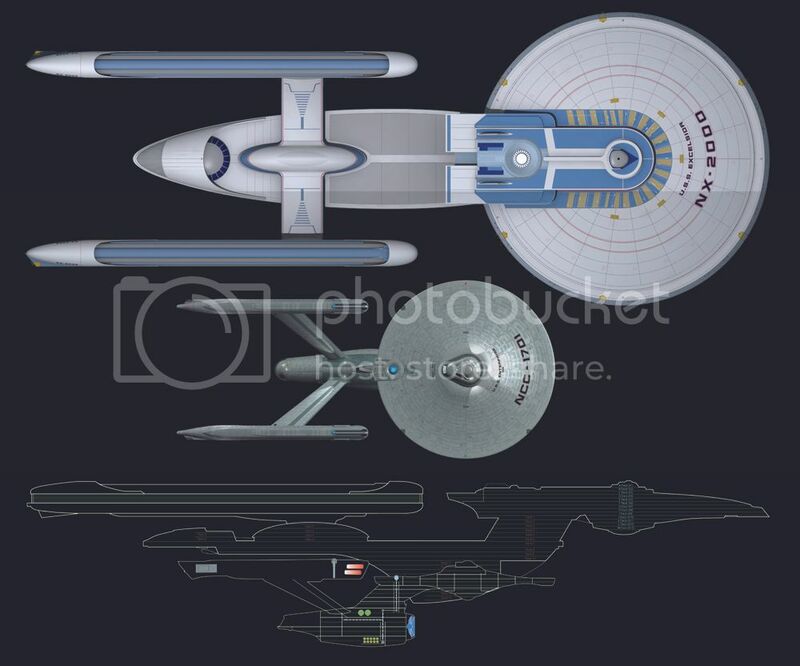 please i am trying to give you this, the only starship i need a lot of info is from the TOS starship only and not no, A, B, C, D, E, or none of the movies from ST1, ST2, ST3, or even ST4 OR 5. I've found there to be 11 saucer decks in the TOS version and 10 saucer decks in the refit, and 8 secondary hull decks for both. (I didn't count the neck, since we may wish to conclude the neck was completely swapped out for this concept of how the refit went.) I estimate 6 TOS neck decks, which fits nicely with TMoST, and 4.5 refit neck decks. 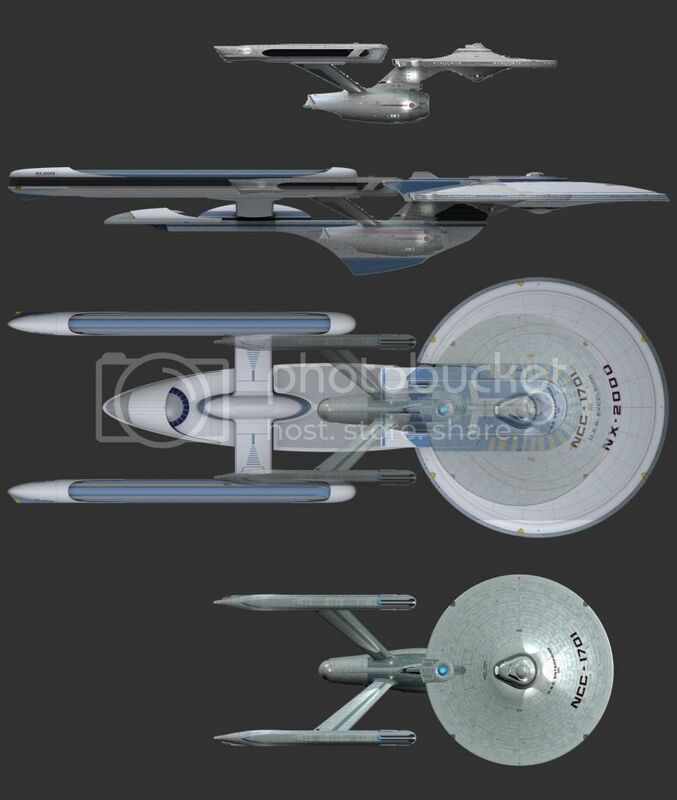 I'm thinking the TOS ship's neck would have 9.5 foot decks, and the refit ship's neck would have 12 foot decks. I'm concluding the refit deck layout to be very similar to Mr. Probert's drawing, and here the TOS versions would have just been bigger by virtue of nacelle and arrangement, combined with the saucer being a little bigger in diameter and the secondary hull being longer. (One might rationalize this as being easy via the rebuild/rearrangement of pressure compartments. Interesting that using this model, the two's official sizes are basically switched. They gain a few meters, but still. Ballot counted, but I disagree on your second point. There's nowhere we actually see the two side by side other than TUC, and I've already gone down that path. Granted, it's all a little squishy. Heh, indeed. Thanks to that squish factor, it doesn't matter too much anymore. The scaling works out a little differently between the top (registry letters) and side (Starfleet logo.) It could also be different if you scale by the ship's name, but I didn't go there. I'm afraid I don't quite understand what you're asking for. You're wanting more information about the size of the TOS ship? I find it interesting that the Ent-D and Excelcior might be so close in length. Indeed I wonder if it could be coincidence. They're not even that far apart in draft. Do you think there might be a Panamax effect happening here? (Panamax --max vol to fit in Panama Canal.) Some sort of convenience that made a voluntary physical limitation to the length of starships that took hold for 60 years? Are there any ships we know of that exceeded that length betweeen Excel and Gal eras? It would explain the relatively strange placement of the Galaxy nacelles. What other vessel --besides Nebula-- attaches the nacelle so far back on the pylon? On another topic, assuming impulse is a a fusion rocket, the exhaust is very likely centered on the ships' center of mass both port-n-starboard and alow-n-aloft, though not necessarily fore-n-aft. That means it should be possible to deduce the relative masses --and therefor densities-- of saucer, engineering and nacelles of at least some vessels, including Constitution and her refit; this should tell us something about the difference in construction between the two, especially nacelle density. This last data point might imply if the warp reactors were inboard or nacelle bound. Not the most accurate picture as the excelsior is abit further away and during the footage it cuts back to the bridge, but you can see even so the Enterprise is considerably more than half the size of the Excelsior. Perhaps the Excelsior *on screen* really is much bigger than 467 meters! I really don’t think there is a definitive answer to this question. The only description we had at the time was that it was “souped-up” and bigger than the Enterprise. The size the miniature was built to, was determined by the camera guys as being the optimal size to shoot. As I recall NIlo did that size comparison chart, but it wasn’t necessarily followed. The issue of true scale wasn’t a consideration. Budget, ease of use, art direction and dramatic intent were what influenced the construction of the ship. The current techniques of the ILM model shop also swayed the look of the ship. If I recall correctly (it was a LONG time ago) some of the detail in the landing bay and the grid frisket patterns used on the hull were left over under-construction Death Star etched brass. Nilo Rodis and Dave Carson had done a number of designs for the ship that I had built quickie prototypes of. I did finish a bit early and Nilo told me I could take a crack at one myself. When they were presented to Nimoy he chose the one I did because I think it looked the most like the Enterprise. Although the prototype had the basic look of the final ship it was a bit frumpy. The model shop supervisor, Steve Gawley, passed the prototype over to Mike Cochrane (I think) who under Steve’s guidance did a beautiful set of blueprints. He really improved and polished the design. The model was built directly from those drawings. Someone mentioned the size of the spacedock doors and how the Excelsior could never fit through them. It’s funny how we never even considered that! The Enterprise was scaled to the doors to make it a dramatic exit. That space dock interior was really a piece of crap. I came up with the idea of doing artwork and large size prints to use as wallpaper for the interior detailing and that stuff was always peeling off. Another funny memory of that set was that it was like a giant “whisper dish” like you would experience at a science museum. If you were on one side talking your voice would be super loud on the other. We farted a lot on that set to much hilarity! Many years later the Excelsior came back to ILM to be re-fitted as the Enterprise B. The upper part of the primary hull and the lower part of the secondary hull were completely replaced. Those piece of the ship were changed enough that replacement was easier that retrofitting. Also, the fiberglass of both of those sections was starting to buckle. In case you are wondering, the original hull pieces do still exist. ☺ I’m sorry I couldn’t be of more help. From the comments I have read here you all know a lot more about this issue than I do. Cheers.